Port Vendres is a natural port on the Mediterranean coast in Languedoc-Roussillon, a little south of Collioure and just north of the border with Spain. The coast here is known as the Cote Vermeille. 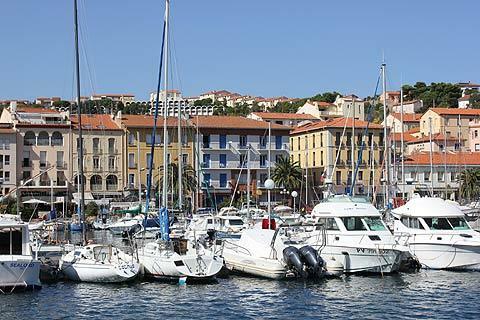 Port Vendres is the only natural port on the Vermeille coast and is both a yachting harbour and an active fishing town: it has been an active harbour since the 6th century. 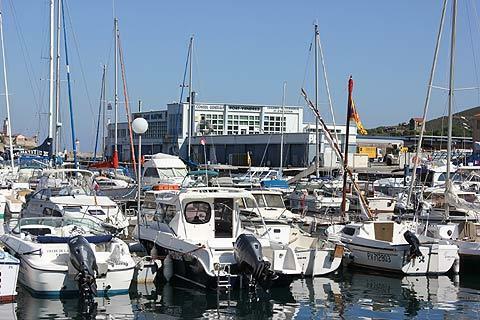 The town sits on the edge of the port overlooking the boats and the Mediterranean sea. In the 17th century Louis XIV asked Vauban (an important milirtary architect of the 17th century) to turn Port Vendes into a military base with appropriate defenses. Vauban built the Fanal Redoubt, the Bear Redoubt and the Presqu'ile Redoubt, although the latter was destroyed apart from its clock tower to allow the port to be enlarged in the 1930s. (A redoubt is a fortified building). In the 19th century further fortifications were added to the town and if you follow the 'Route des Cretes' you can see these. Another important stage in the town's history was the time spent here in 1925 and 1926 by Rennie Mackintosh. His time in Port Vendres is said to be the happiest of his life and he painted several watercolours here. He asked for his ashes to be scattered in the Bay. Ask at the Port-Vendres tourist office for their map and this will give you a route to see the main monuments of the town. Your visit to Port-Vendres will centre on the colourful port, which is a pleasant place for a promenade and where you can see Vauban's defenses: Fort Fanal - the Redoute du Fanal - with its green lighthouse sits to the North of the Port. Opposite it on the south side of the Port is the Redoute Bear which is now the Sidi Ferruch museum dedicated to French/Algerian history in the 19th and 20th century. The clock tower on the Quai de la Douane is the part that remains of the Presqu'ile Redoubt. Near the office de tourisme on the Quai Pierre Forgas is a bank which used to be the Hotel du Commerce and it is here that Charles Rennie Mackintosh spent two winters near the end of his life. A path around the port shows reproductions of his work at the different places where they were painted. An obelisk was erected in the 18th century in hommage to Louis XVI. This is in the Place de l'Obelisque as is Le Dome which contains an exhibition relating to Rennie Mackintosh. 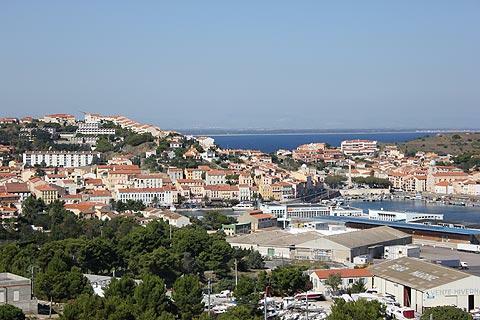 Port Vendres has beaches but they are a short distance away from the town centre, about three kilometres. The three principal beaches are in the attractive bay of Paulilles and two of these have lifeguards in July and August (plage de Bernardi and plage Del Mitg). There are several smaller beaches in the inlets between the rocks if you are searching for a bit of solitude and various activities such as fishing, cruises and sailing are also available. Few visitors will be able to resist the temptation to sample the local wines - and why would you try! Those from nearby Banyuls-sur-Mer are the most famous but Collioure and Port-Vendres also have their own wines. The Route des Cretes is a mountain road with great views over the coast. It also offers a closer look at the Tour Madeloc, a 13th century early warning system, and the Batteries Taillefer and the Fort Gallinge which were built in the 19th century to defend the town and its coast. Between Port-Vendres and Collioure is the Fort Saint Elme. This started life as a 9th century signal tower but star shaped fortifications were added in the 15th century. In the 17th century Vauban added further to the fortifications. It is worth a visit not only to see the substantial fort but also for the views over the coast. The nearby village of Cosprons has a chapel containing a rare carving of the 'marine Christ' dating from the 14th century. The marine Christ wears a crown of rope rather than thorns.